HP's new CEO, Meg Whitman, will receive $1 a year in salary. But she's eligible for stock awards and bonuses -- plus she's a self-made billionaire. 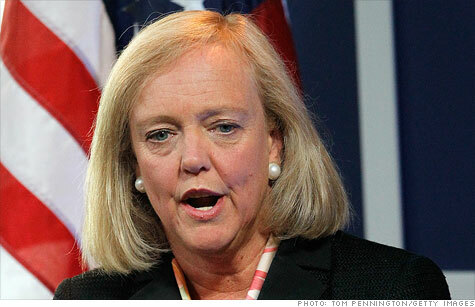 NEW YORK (CNNMoney) -- Hewlett-Packard's new CEO, Meg Whitman, will receive an annual salary of $1. Meanwhile, her ousted predecessor, Léo Apotheker, is walking out the door with nearly $10 million cash in severance and bonuses. But don't feel too sorry for Whitman: She's eligible for millions in cash bonuses and stock options, according to HP's regulatory filing late Thursday. Whitman's target bonus for HP's 2012 fiscal year is $2.4 million, and she could get as much as $6 million if the company hits certain performance goals. Her contract also includes an option to purchase 1.9 million shares of HP (HPQ, Fortune 500) stock, which fully vest if she's at HP for three years. The exercise price on the options is $23.59, HP's closing share price on Sept. 27, the date Whitman's stock grant took effect. That means Whitman's HP stock options will only be profitable if the company's share price goes up -- and the shares will only fully vest if HP's share price rises by at least 40%. Her contract includes no special severance benefits if she is ousted beyond a lump-sum payment of 1.5 times her annual salary. That would net Whitman a grand total of $1.50. Whitman -- No.9 on Fortune's latest list of the Most Powerful Women in business -- is already an extremely wealthy woman. According to Forbes, she's one of only five female self-made billionaires in the world and currently has a net worth of $1.3 billion, thanks to her time at the helm of eBay (EBAY, Fortune 500). So a $1 salary won't hurt Whitman's wallet much -- and she's likely hoping that the gesture will show that she's focused not on money, but on turning HP around. The company's TouchPad tablet was a failure, phones aren't selling and PC sales have slumped globally. Last month, then-CEO Apotheker tried to remedy those issues with a shocking announcement: HP would end the experiment with webOS and get out of the PC business entirely -- a market that it leads both in the United States and globally. A few weeks later, on September 22, the HP board announced it had ousted Apotheker and replaced him with Whitman. Apotheker has already scored millions from his 11-month tenure at HP. Before he was fired he had already taken home most of his $1.2 million annual salary, a $4 million signing bonus and an additional $4.6 million awarded for relocation assistance and to offset payments that he forfeited from his previous employer, SAP (SAP). Apotheker will receive $7.2 million in severance, which will be paid out over the next 18 months. He'll also receive a bonus of $2.4 million for his 11 months of service. Also, HP will pay Apotheker up to $300,000 for any losses or fees on the sale of his California home, and will immediately vest 156,000 shares of stock valued at $3.6 million on the day Apotheker got the boot. Apotheker retains some restricted stock grants that will only pay out if HP hits certain future financial targets, but he waived rights to around 40% of the restricted stock that he had contractual rights to claim. The final kicker, though, is that HP is paying Apotheker, a longtime resident of Europe, to get out of the country. The company reported that it will pay "reasonable relocation expenses, including return airfare, for Mr. Apotheker and his spouse to France or Belgium." Oracle kicks HP while it's down. But why?